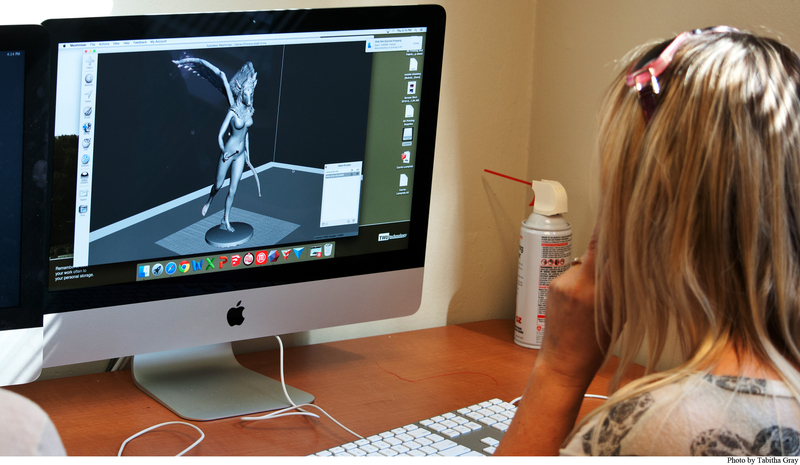 A student works with Sketch Up in a 3D Printing and Fabrication class. To explore a wide range of mediums through hands on activities and demonstrations of various DIY activities, check out the Denton Mini Maker Faire held on Saturday Oct. 17 in the Denton Civic Center from 10 a.m. to 5 p.m. The event will encompass various booths on everything from the archaic, such as large scale weaving, to the unique, like making ukuleles out of cardboard, or more technological, such as making custom light sabers. TWU associate professor of visual arts Dr. Colby Parsons explained that the Mini Maker Faire is part of a larger creative movement that overlaps with the concept of DIY and is often associated with the publication Make magazine. In the maker movie, people of all skill levels tinker with all kinds of creative activities and technologies. Parsons’ 3D Printing and Fabrication class will also be participating in the faire, where students will demonstrate using a 3D scanner on attendees by creating a scan of their torso and emailing a copy to patrons. Patrons can access their scan and manipulate it using free programs that Parson’s class will also be showing. A 3D printer will also be present to allow participants to see a print coming out. Student participation is required at the faire for Parson’s class, where Parson hopes students will gain applicable experience to use in their field, whether they decide to teach art or create it. Visual arts instructor Barbara Core will also be demonstrating papermaking and book binding with some of her students. Other organizations and sponsors affiliated with the event include UNT, Denton Public Libraries, Scrap and even the Perot Museum. Many types of creative interests are represented at Denton’s Mini Maker Faire, which Parsons hopes will have a positive turn out from the community and encourage people of all ages to try new activities that transcend technology and art. Here are the solutions for the games on Oct. 14. Check out next weeks issue for more games!